October half-term is nearly here but the summer holidays only seem to have finished hours ago! 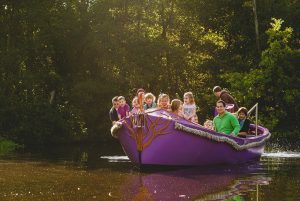 Despite the weather cooling down, the good news is that there’s no shortage of things to do around the Norfolk Broads, keeping everyone happy during the October half-term. With Halloween just round the corner too, there’s nothing but a ‘treat’ of activities to be found. You’ll find a hosted craft fair on 24 October from 11:00 to 16:00 where there will be range of local craft stalls and demonstrations and the stunning landscaped gardens are open. An orienteering activity and dyke dipping for children is on offer (£1 per child). Homemade cakes, refreshments and light lunches available throughout the day. No booking necessary. £3 per adult, children and Friends of How Hill free. Mooring is at the foot of the hill, a short walk and you’ll find yourself in the heart of the beauty of How Hill. It can also be reached by car and parking is free. 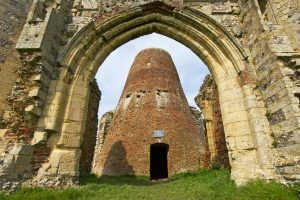 Combines the joys of the great outdoors & a fun history lesson (it can be reached by boat if you’re exploring the Broads by water). It has a truly spooky history that you can terrify your children with! Perfectly ghoulish entertainment for the days before Halloween. Open all year round (Monday to Saturday, 10am–5pm; Sunday, 1–5pm) except 24–26 December and 1 January. This must-see castle is a historical landmark dating back to 1067 when it was built by the Normans. It was used as the county gaol from the fourteenth century until 1792 when a new gaol was constructed. 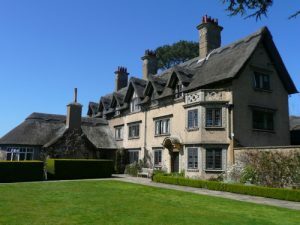 It was converted into a museum in 1883 after many years standing derelict and unloved. 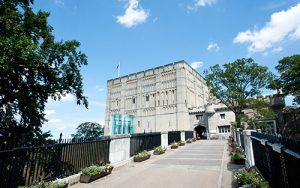 Since then it has housed a huge collection of local Norfolk artefacts and other fascinating attractions. After your trip around the collection, a stop in the well-stocked café will revive you and your little ones before you head out into the ancient city of Norwich. Eleventh-century Norwich Cathedral is just an eight-minute walk away from Norwich Castle and is the perfect end to an educational day in city. Reach this magical inspired woodland play park by car or at moorings a 20-minute walk away at Womack Staithe. You and your young ones can run WILD through tree houses, sliding on slides and zipping down zipwires. The Glorious Glowing Lantern Parade runs from Sat 13th October – Wed 31st October and the park is transformed with spooky decorations. The park encourages visitors to wear their best spooky costumes and visit the free face painting pavilion. Make a lantern during the day in the Big Hat teepee and stay till dusk when the inhabitants celebrate in a glowing lantern parade. Choose from one of 13 days of fun at the ultimate spooky experience, the 2018 Halloween Spooktacular opening on 18th October until October 31st. Go in fancy dress and immerse yourself fully in the fun watching Hippodrome favourites Jack Jay and comical Johnny Mac. They will be joined by an amazing cast of international acts. Booking in advance is strongly advised. Parking is available in the surrounding area or if arriving by boat, moor at Great Yarmouth Yacht Station and take a 20 minute walk to the circus which is located off Great Yarmouth’s iconic ‘golden mile’ stretch of seafront. Moor or park at Wroxham and hop on the boat taking you round to Barton House from Wroxham Bridge. 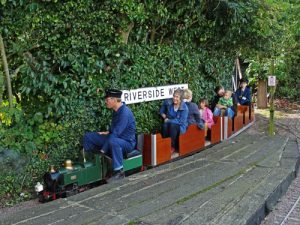 From 14.30 to 17.30 on 21st October you’ll have the chance to ride on two miniature railways on the banks of the river Bure. Controlled by full size MGN signal box. Have a go at driving a train. Refreshments are served by the lawn or by river. Entry is just £3 adult, £1.50 child. Friends of Salhouse Broad present family fun. Follow the spook-tacular pumpkin trail around the Broad and indulge in some ghoulsome games with tricks and treats! Grab a creepy coffee, horrible hot-chocolate and some freaky food whilst you’re there! The trail lasts approximately 1 hour and is held on 26 October 2018. Costs £4 per trail sheet and includes a prize. 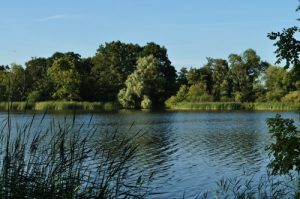 Mooring is available at Salhouse Broad or park at the top of the hill around a 15 minute walk away. Forage for an acorn in our woodland garden then squirrel it away in a recycled pot using Fairhaven leaf soil to grow your very own oak tree. You’ll find this event on Thursday 18th Oct 10:00am – 4:00pm. This activity is included in garden entry fee – check their website for prices. It’s free to members and booking is not required. You can moor at South Walsham Staithe and walk to Fairhaven in around 15 minutes or parking is in plentiful supply on site if you’re arriving by car. 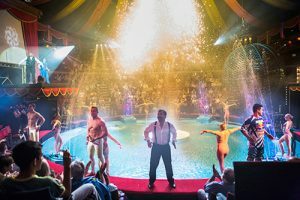 Part of a nationwide museums partnership, this exhibition details the origins of Circus from the Ancient Greek ‘Hippodrome’ through to the last 250 years and beyond. The exhibition runs from 6th October 2018 – Sunday 3rd Mar 2019 and is open 10:00 to 16:30 daily. Parking is available outside or moor at Great Yarmouth Yacht station and take a 20-minute walk there. Whatever you all get up to during your October half term, there’s no doubt that come bedtime, everyone will be ready to sleep soundly the whole night through! Running from the 20 October to 4 November, take a step into the creepy deep at SEA LIFE Great Yarmouth this Halloween and navigate the Ascarium; an immersive trail which takes you past some of the scariest sea creatures.For a limited time only, five potion ingredients will be hidden in various tanks throughout the Ascarium, and guests will need to find them before making their way to the Sea Witch’s lair.Along the way, guests will discover facts about some of the freakiest creatures of the sea, including blob fish, African tiger fish, goblin sharks and barrel eye fish.Once all of the items have been located, the Sea Witch will cast her magic spell and open the treasure chest, giving those who successfully navigate the trail a reusable Ascarium cup.